Today there is more and more of a focus over how we look. Jesus’ teaching is clear about how we should see ourselves and others. But whose eyes do we see ourselves through – Jesus or others? As a nurse working in ICU, I took a report about the patient I would be caring for that evening. I was told to be prepared, that cancer had dramatically distorted the patient’s face. I prayed before entering the patient’s room that I would see what Jesus sees. I was led to look straight into his eyes while speaking to him. His eyes were the window into his soul and I saw a kind and beautiful person. God spoke to my heart that this was who He sees. That experience has stayed with me for over 30 years. It helps remind me to look straight into a person’s heart rather than their outward appearance to see how Jesus sees them. Peter teaches us about what our focus should be about our own appearance. St. Francis had riches that allowed him to have the finest things money could buy. He shed all that so he could remove the worldly distractions and focus on the appearance of his heart. I ask myself the question…. Do I spend as much time on my outward appearance as I do the condition of my heart? How do I see myself? 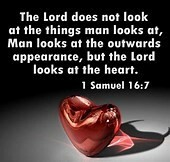 How does that compare to how Jesus sees me when he looks into my heart? When I feel misunderstood or wrongfully judged as a person I try to remind myself that it is Jesus I seek to please. I know He understands because He was misunderstood. A friend of mine once said that she felt invisible by certain people. I assured her that she was not invisible in God’s eyes and that is all that matters. When I reflect on these readings I am reminded about how incredibly relevant the word of God is today as it was when he was among us. Not a new or easy challenge. Jesus help me to see the beauty you see within me and help me to avoid the temptation to see myself as the world sees me. Help me to seek to make my heart more beautiful in your sight. Jesus please lift the veil that I might see beyond the distractions of the world and see others as you see them and love them as you do. Joanne Leichte has been happily married for 41 years and is blessed with a daughter and married son and 2 granddaughters. 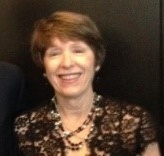 She is a member of St. Francis parish and a team member of the Marriage Prep Ministry for 40 years. She is one of the co-founders of Interfaith Health and Support Services of Southern Ocean County Inc., that provides support to frail isolated seniors and their caregivers.